A worker drinks carbohydrate rich honeydew from a scale insect. A few weeks ago while mowing my lawn, a sharp pain in my ankle, the sure sign of a sting from a bee or wasp startled me. As I danced away from the mower, a swirling storm of yellow jackets emerged from a hole in the ground and searched for someone or something to sting. Yellow jackets are among the most aggressive of stinging insects found in Maryland. Unlike the European hornets we visited last week ("A rather continental hornet – European hornet, Vespa crabro"), these gals seem to seek vengeance with little provocation. Several species of yellow jackets are found in the mid-Atlantic region. 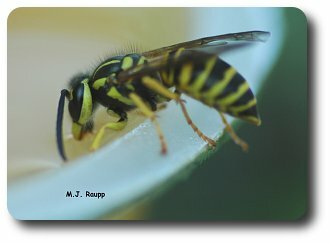 The ones nesting in my backyard were natives, the Eastern yellow jacket, Vespula maculifrons. Yellow jackets share much behavior and ecology with their relatives the European hornet. Females usually spend the winter in protected locations outdoors and start new colonies in the spring. These colonies can be underground, within voids in walls or man-made structures such as sheds or old cars, or in dense shrubs or vegetation. Nests are made of paper and an outer shell encloses comb that houses the developing yellow jacket brood. Unlike the nests of bees, these nests contain no honey or pollen. 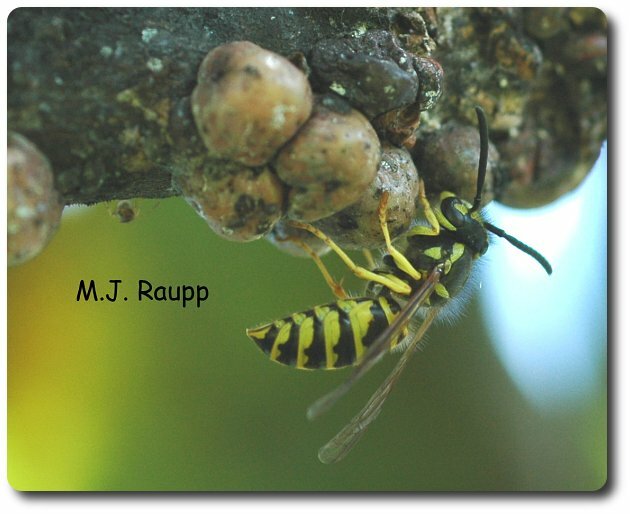 Yellow jacket larvae in the nest eat meat and carbohydrate rich foods provided by the workers. In this regard, yellow jackets are beneficial because they kill many insects such as caterpillars and beetles that are pests in our gardens. By late summer and early autumn colonies can contain thousand of workers and are often about the size of a football. Under extraordinary circumstances, some nests may persist for more than one year and become enormous. There are reports of monster yellow jacket nests in southern states reaching the size of a “Volkswagen Beetle”. Yikes! I sure wouldn’t want to bump into one of those with the lawn mower. Autumn is the season that yellow jacket workers become quite aggressive. At the Labor Day picnic yellow jackets battle for hamburgers or barbecued chicken to feed the developing queens back at the hive. Yellow jackets also are common around sweets such as fallen fruit or open cans of soft drinks. Be careful when you picnic. Gently brush workers away from your food rather than slapping them. If you blunder upon a nest in the lawn or in a bush, walk away from nest as quickly as possible with a minimum of swatting and arm flailing. Quick movements will insight further attacks. Leave the immediate area of the attack. Walking through a bush (no, not one with the nest) may help throw the pursuing workers off your trail and help you escape without further stings. When an attack is made, the yellow jacket releases a chemical signal called and alarm pheromone into the air. Empty brood comb and a hole in the earth are all that is left of the yellow jackets after an attack by a hungry mammal. The pheromone signals other yellow jackets to attack and sting with extreme prejudice. Yellow jackets are capable of multiple stings but only to a limited extent. Contrary to common belief, they have barbs on their stingers and many will lose their stingers and be eviscerated in the process, thereby sacrificing their life in defense of the colony. If you are stung, apply ice to the site of the sting may reduce some of the damage and pain. Sting relieving ointments and creams can also be purchased in pharmacies and sporting goods stores and may help some folks feel better. If you know that you are allergic and are stung, seek medical attention immediately. If you are stung and experience symptoms such as shortness of breath, difficulty breathing or swallowing, hives on your body, disorientation, lightheadedness or other unusual symptoms seek medical attention immediately. Desensitization therapy has proven very helpful to many people with allergies to bee and wasp stings. If the yellow jacket nest is out of the way and unlikely to be encountered by humans or pets, you may simply leave it alone. If the nest is in a place that threatens you, your children, or your pets, you may consider eliminating it. Commercial pest control operators can assist you in this. I have purchased aerosol sprays, applied them according to the instructions on the label, usually at night or in the evening, and had excellent success. As for the yellow jackets in my backyard, well, Mother Nature had a surprise for them. Two days after they unleashed their attack, I found the colony annihilated by some determined and courageous mammal that had exhumed the nest and eaten every last yellow jacket larva inside. Since there was no honey in this hive, I don’t’ think Winnie the Pooh gets credit for this one. I assume that some ferocious skunk, raccoon, or fox enjoyed a zesty snack of yellow jacket brood. One has to wonder if the pleasure was worth the pain.